Software for the acquisition of the real time transactions and for their subsequent implementation through software applications. HTR allows to record in real time the transactions made by the user, through the acquisition of the tickets issued by the scales. The acquired data becomes therefore available for subsequent implementations by the software applications. 810303 Nr. 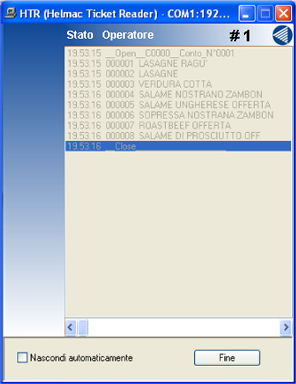 1 License for HTR - Helmac Ticket Reader - software for the real-time acquisition of transactions.